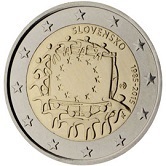 Details relating to the Joint EU Commemorative of 2015. 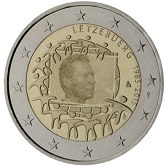 This is the fourth joint issue where all the existing members of both the EU and the Euro zone issued at the same time basically the same coin, only differing in the issuing country designation. 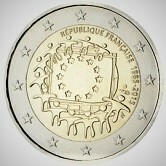 A slight exception to this is Luxembourg where the law requires that all coins show the head of the reigning grand duke. The cause of celebration is the 30th anniversary of the creation of the European Flag. The motif chosen was selected by online voting by EU citizens. 62 designs were created and that of Georgios Stamatopoulos from Greece was the winner. In the inner circle the EU flag is shown in front of the earth. Partially surrounding the flag are 12 stylised figures. According to the designer it represents the people of Europe and the joint cultural path/development of the Europeans. For all countries the country designation runs from around eleven o’clock to around three o’clock. This of course varies with the length of the country name. If the coin has a mint mark it is at three o’clock. 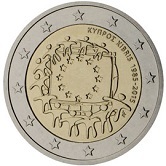 Return from EU Commemorative 2015 to euro coin collector.